State governments in Australia are getting behind residential storage – solidifying Australia as one of the most attractive markets in the world. South Australia has already attracted Sonnen GmbH, AlphaESS and Eguana Technologies to set up local assembly facilities. BNEF expects over 70,000 Australian households will install batteries this year – driven by A$147 million in state government subsidies, as well as low-interest loans and demand response schemes. If the federal opposition wins the election this year, a further A$200 million will subsidize another 100,000 household batteries from 2020. 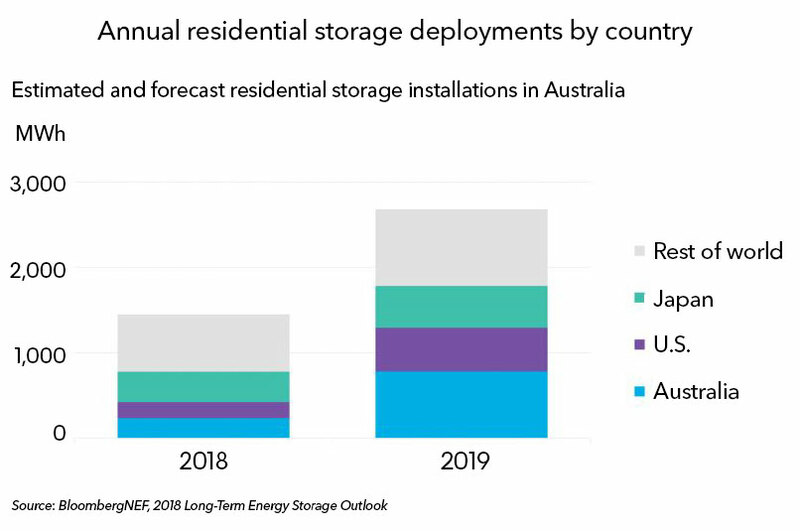 While the path could be bumpy, BNEF expects Australia to continue to be an attractive market for residential storage after policy support ends – thanks to its high penetration of household solar (already one in five) and high electricity costs. BNEF clients can access the full report, Australia Residential Storage to Triple, Despite High Cost, on the Terminal or on web.